The origin of the village's name has always been a matter of argument. The village is listed in the Domesday Book of 1086 as Alham. This may have derived from Ulaham, which it is referred to in an Anglo Saxon charter of 855A.D. The suffix "ham" is derived from the German word "heim", meaning "home". Thus, it is assumed that Ulaham means homestead of a person named Ula. Another theory is that the name originates from the presence of eels once found in the Nailbourne centuries ago. 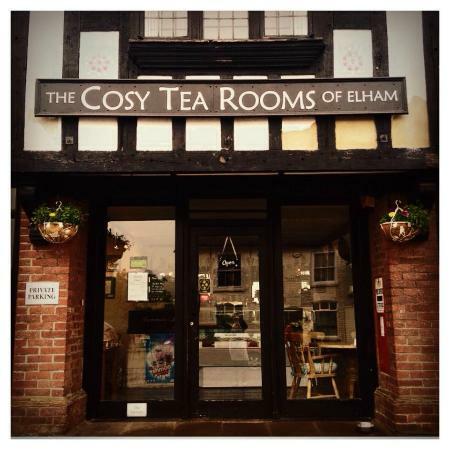 I visited The Cosy Tea Room of Elham on a dull but warm day and was pleased to enter a very warm, charming tea room with happy and smiling staff. The tea room is effectively split into two sides with seating either side of the front door with the main door being symmetrical….to my delight! I love things being symmetrical! The tables and chairs are of old country pine appearance, nice and large and not cluttered or close to each other, all with pretty dried flowers. The display counter was directly opposite the main entrance with a tiled floor taking you to the counter. The two sides of the tea room are carpeted and the walls have a large selection of pictures and paintings which you can buy if any take your fancy. Similarly, lovely gifts were on display with some very nice greeting cards for sale. The main gift feature was a large selection of hand crafted sea-glass jewellery. Sadly, there were no table menus so you had to go to the counter and order from two chalk display boards; one on the wall and the other in the counter. Whilst there, you can check out the counter display of cakes and scones. There is a variety of teas and fresh ground coffee. The usual tea room food was offered which included; jacket potatoes, fresh sandwiches, rolls, home made soup, home made quiche. They also offer a take-a-way service as well. I had a meat and potato pie, baguette, scones which were fresh and fantastic and a pot of tea served in a white tea pot and white jug. The cup and saucer was china and I notice that cups and saucers were mismatched, just like Miss Mollett's. I had spoken the two members of staff, one being the owner and they were very happy and pleasant people….a delight! I can recommend this tea room, quite lovely, although the music was not of the tea room kind, nevertheless it is a very delightful and 'cosy' tea room and free parking was available.